We have completed the merge and audit of all the VP6D logs. As you probably know, we experienced some challenges when N1MM and WSJT didn't play well with each other. We had to do a significant amount of log work to remove almost 5,000 dupes incorrectly created by the FT8 RR73 issue. The logs were inspected for completness, no QSOs were lost in the process. 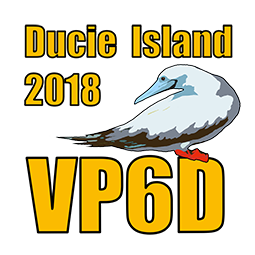 The 6 meter EME QSOs were added to the VP6D log. The /MM log still needs some attention due to a clock error. More to come as we get back into a routine at home.